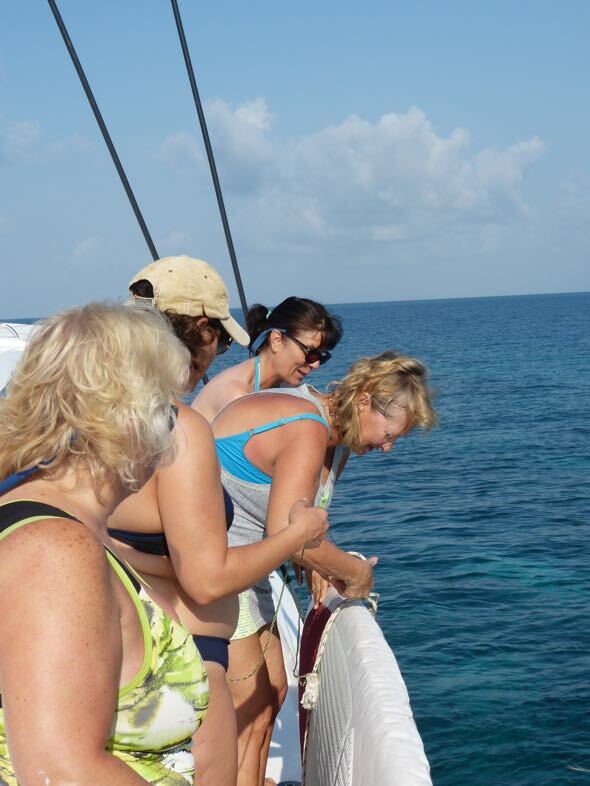 Cruising the Belize Barrier Reef System on board a 4800 Moorings catamaran is anything but boring! But there are everyday tasks that need to be performed to keep the boat and crew happy. First, it's all about the food! A great deal of thought goes into provisioning for one of these trips. Especially in out-of-the-way places like Placencia, Belize. Mid-way in the trip planning process, Betsy sends out a questionnaire to the guests, asking them to identify any allergies, likes, dislikes (liver), gluten-free, etc., and suggests to anyone with off-the-wall preferences, (chocolate low fat soy milk) that they bring it with them, as it is highly unlikely this kind of product will be available. When these questionnaires are returned, she starts considering the meals. On this trip, Lu Ann was the designated cook, so when we landed in Placencia, she and Betsy went grocery shopping, using the lists as a guideline, and improvising, depending on what is available. So, first thing in the morning, the generator is started to provide power to the coffee maker, probably (in my mind) one of the most important pieces of equipment on board. This trip, a normal breakfast was coffee, granola, yogurt and the wonderful fresh fruit available in this part of the world. Other breakfasts included breakfast burritos, pancakes and scrambled eggs. Lunch was varied, including pasta salads, sandwiches and salads. This was often enjoyed underway as we headed to our overnight destination. On this trip, we ate dinner ashore several times, able to sample the local fare; traditional Belizean food and lots of seafood. Some of the restaurants were toes-in-the-sand but none required shoes! Definitely a bonus. Just like a car, the boat required general maintenance. Not the heavy kind, just things like engine oil check, water intake strainer cleaning, cooling fluids check, and holding tank clearing. Betsy was the "lucky" person responsible for this and it is no mean feat to slither down into the engine compartments to do the checking! There are four heads (toilets) on this boat (actually five, but one was way up forward that did not get used) and four showers. The heads empty into holding tanks (no paper or any other "solids" went down) and when we were in the deep channels, it was permissible to flush the tanks. It's something that goes against the grain for me, but there are no other options as there are no holding tank pump-out facilities. The showers drain into sumps which also have to be pumped after each use. With 160 gallons of water, it was important to use restraint when showering. The California crew members were used to this, as they live through the devastating drought there. So the below-deck showers weren't used a lot, as there is a fresh water shower on deck to rinse off after swimming. And most of us used biodegradable, natural soaps and cleansers to minimize any adverse issues! We collected out trash and it was stowed in the forward lazarette for disposal at the Moorings base on our return. Our engines, which we used a lot, as there was absolutely NO wind to sail, kept our 12-volt system healthy, but we ran the generator every morning to charge electronics and make coffee, which is a household machine. The boat is air conditioned, but we only used it two nights - one on our first night which we spent at the dock, and the second time the last night out, when it was totally still and the cabins were stifling. The AC requires generator power, which is noisy so mostly we opted for natural breeze and circulation. However, Jane and I both chose to sleep on deck, and as there was absolutely no sign of rain, we felt pretty confident that we wouldn't have to make a bee-line below during the night! The VHF radio is the lifeline to civilization in the boating world. Every morning between 9:00 and 9:30, the Moorings base came on with a weather forecast, that incidentally didn't change until the day we disembarked, when a cold front and rain was predicted. Talk about good timing. The radio is also used to call the local island restaurants for reservations, a very important function! Most boats monitored Ch. 16, the safety channel, so the quiet was often broken by a call asking a boat to switch channels for a chat. 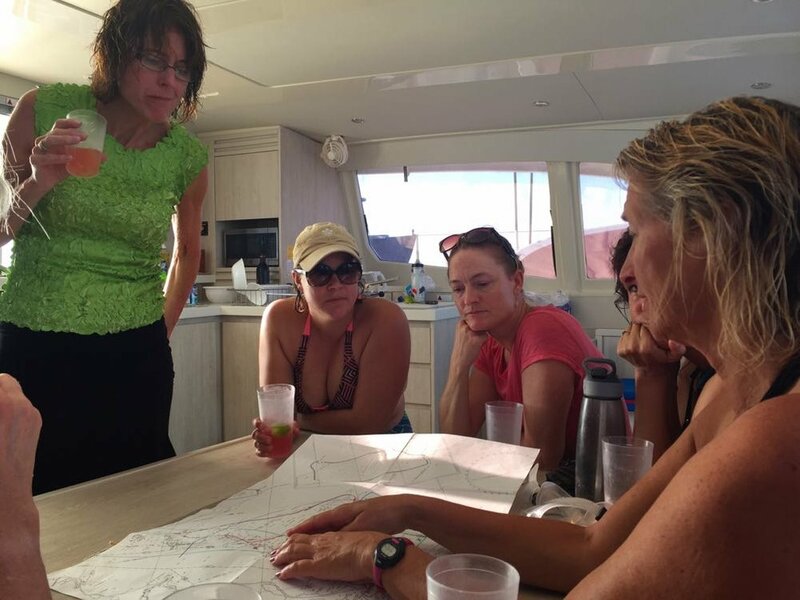 As skipper, Betsy was in charge of getting where we wanted to go. The boat is well-equipped with the latest navigation gear, including a chart plotter, depth sounder, windex etc. The base also provided a cruising guide and a chart with preferred routes marked on it. The chart plotter was also programmed with waypoints to follow through some of the extremely shallow, narrow passages! The area is only partially charted, and the guide books courses and waypoints didn't necessarily match with the ones from the base. So navigating was a bit hair-raising and we always had two of us at the steering station, plus through the tricky areas, crew were stationed as lookouts on the bow, watching for shallow areas (bright turquoise), areas of sea grass (clear but tinged with brown) and the deep channels (deep blue). Mooring was preferred and we were fortunate to pick up a buoy at almost all our overnight anchorages. By the end of the trip, the crew were masters at it, picking up the mooring line on the first try and threading the mooring lines quickly before securing them. Anchoring can be an issue, but again, by the end of the trip, we had it down to a fine art. Learning how a boat responds, the feeling of the anchor "setting" and how much scope to let out is something that takes a bit of time. The last spot we anchored was picture perfect! Right on the edge of the sandy spot, the anchor dug in just like it supposed to and with lots of chain out, we spent a very secure night! We were lucky to have two paddle boards and a three-man kayak to play on. They were kept lashed to the lifelines while underway. Once anchored, they either went directly overboard or stored on the forward trampoline for easy access. But each time they were used, they were brought aboard. Our great inflatable dinghy lived in its davits most of the time. It was always brought out of the water at night for security and generally we ran with it secured, as well. Only once, on a very short passage to Silk Cayes Maritime Reserve, did we tow it. Everyone did their share, specifically keeping their own space tidy and helping keep the main salon and deck areas comfortable. There were times when piles of goggles, snorkels and fins threatened to take over the cockpit, but generally everyone was conscious of safety issues (keeping walkways clear etc.). The only rule we tried to keep was to dry off as much as possible before going into the main salon, and we kept a large towel in the doorway to catch drips. The cabin sole could get quite slick and we didn't need anyone slipping and hurting themselves. So generally, life was simple for everyone.